One of a set of four PHQ stamp cards issued in 1981 on the theme of folklore. I find it slightly odd that St Valentine would be considered folklore when he is an "official" saint, the patron saint of engaged couples, happy marriages, love, and bee-keepers (amongst other things). 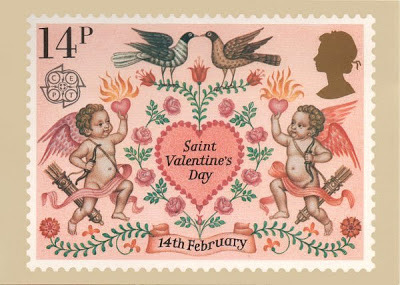 The current traditions associated with Valentine's Day were apparently made up in the 14th century by Chaucer and others. I suppose that's long enough ago to argue the case for folklore. The other stamps in the set were Morris dancers, Medieval Mummers, and Lammastide. You're right, it's busy. So busy, I hadn't noticed the flaming hearts! That's a pretty stamp, I'd forgotten all about it until I came across a cover for that set when looking for folklore. I didn't know that St Valentine had a connection with bee keepers. Various other things too, like epilepsy and plague which don't suit the image one bit. I noticed the flaming hearts too! Interesting touch. I always love to see cupid! It's a very pretty stamp, but you're right he doesn't quite fit with the other three. I have the other three but would never have guessed that this one went with them. Dickie Valentine got nearer to folklore than the Saint.